16 ounce Apple Cinnamon pickles are a Candied (twice sweetened with pure sugar), 1/4 inch chunk cut pickle flavored with apple and cinnamon spices. Ingredient Statement: Cucumbers, Sugar, Water, Vinegar, Salt, Spices Natural & Artificial Flavors, Alum, Turmeric and 1/10 of 1% Benzoate of Soda Added as a Preservative. From Marilyn A. Schneider of Fortville, Indiana on 1/1/2019 . I enjoy the candied apple cinnamon chunks very much. they are the best! From Donna Fosteson of Indianapolis, Indiana on 11/10/2018 . These are my favorite pickles. 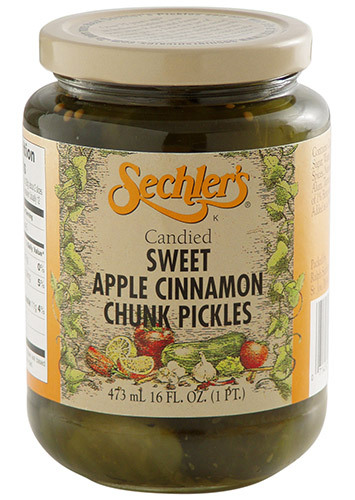 I know apple cinnamon sounds like a strange combination for pickles, but once you try these, you will be hooked. I just wish that Wal-Mart in Fishers still sold these. I will definitely continue to buy direct from Sechler's. The pickles arrived quick and packaged extremely well. Thank you Sechler's for fantastic tasting pickles! From Susan wheeler of Indianapolis, Indiana on 11/4/2018 . From Anonymous of Spencerville, Indiana on 2/4/2018 . I have yet to taste any sechler's pickles that i do not like. The apple cinnamon however are my family and mines number one choice with bread and butter pickles coming in at almost a tie. Great flavor every time and so cripsy and crunchy. I have to have a crunchy pickle. Thank you and please never discontinue the apple cinnamon pickles. From Anonymous of Des Moines, Iowa on 12/16/2017 . Love the taste of these pickles! Ordered on line and received them in a short time. Packing of the jars in the box was great! All arrived safe and sound. Will be ordering more in the future. I wish I could get these in our local grocery stores!